"This is a super easy, fast casserole - kids love it! My mother and grandmother always made this casserole." 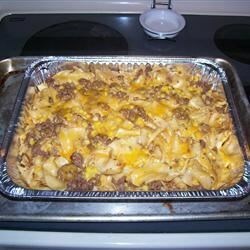 In a large skillet, cook and stir ground meat until browned. Drain off excess fat. Stir in corn and tomato soup. Simmer while the noodles are cooking, about 10 minutes. Cook pasta in a large pot of boiling water until al dente. Drain. Stir noodles into ground beef mixture, and sprinkle parmesan cheese on top. Serve immediately. I thought it was too dry. Needed more tomato soup or something else for moisture. This was a good recipe with a few variations. I added diced tomatoes instead of tomato soup and then I topped the dish with shredded cheddar and swiss cheese. It was yummy! I made this dish last night. I will admit by the name of it it did not sound very appetiting. But needless to say my family loved it! We will definitly have this dish again. This is a good recipe, but my family felt that it needed more tomato soup to give it more moistness.